The lemon meringue pie macaron is really easy, because the shell is just the plainest macaron you can make (meringue flavour) and the filling is just lemon buttercream made as lemony as possible with real lemon juice, zest, and lemon extract. The margarita macaron is a lime flavoured shell and tequila buttercream. One tip I have for thinking up new macaron flavours is NOT to add extra liquids to the shell recipe. You can add powdered flavours by replacing some of the powdered sugar with something like powdered freeze-dried strawberries, or cacao. But adding liquid just leads to liquidy macarons... and those do not turn out well... I say this because I added lime juice to the maragarita macaron shell and it was a mistake in the end... lime zest would have been fine. 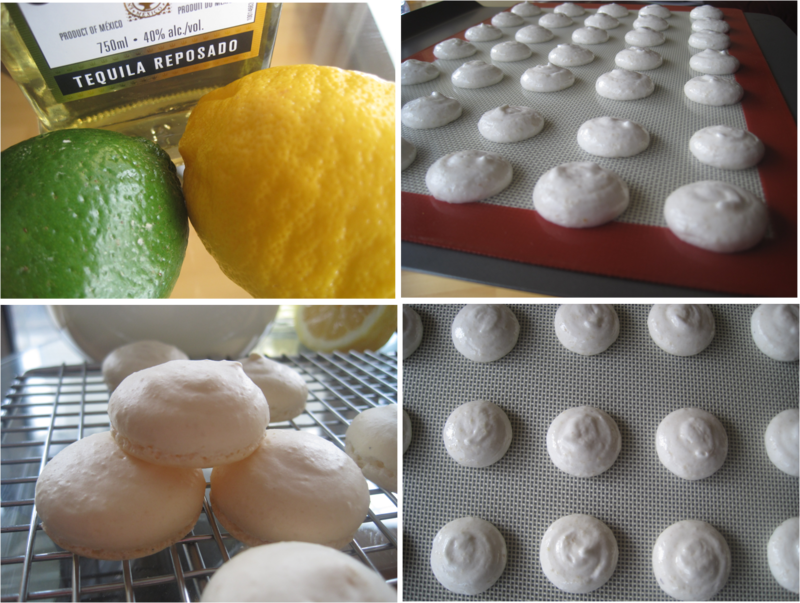 The tequila buttercream is just regular swiss meringue buttercream with 3 tbsp of tequila added and a couple pinches of salt to make it taste extra authentic. Just add the tequila till you think it tastes tequila-ey enough. Super fun! I have so many other ideas for flavours. I definitely want to try chocolate-chili, cassis, other cocktails like pina colada or mojito... and it goes on and on... What flavours would you try? In a large bowl, beat egg whites and vanilla until foamy. Add granulated sugar little by little while beating until you get glossy, stiff peaks. 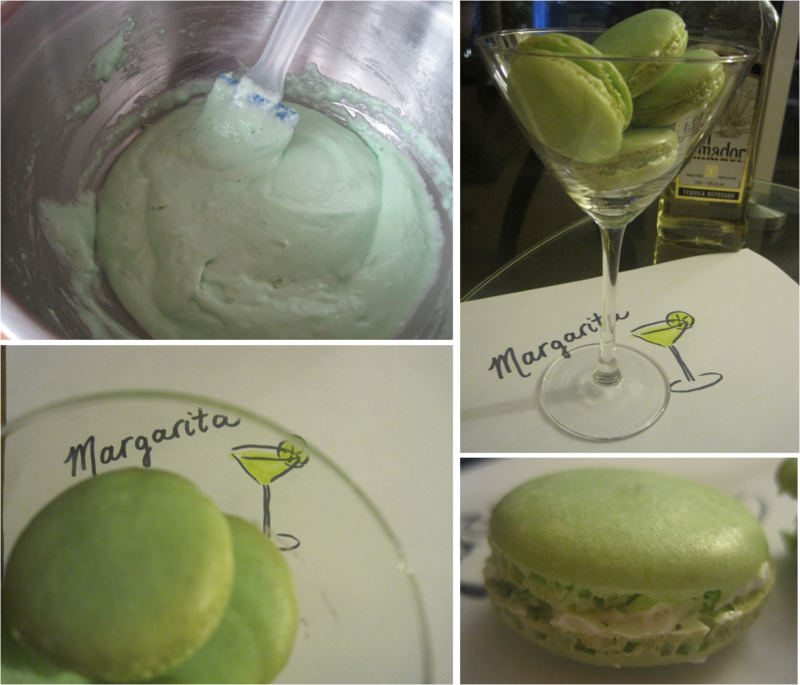 If colouring your macarons, add gel paste food colour to whipped egg whites near the end of whipping until combined. In two additions, fold powdered sugar/almond mixture into whipped egg whites until just combined. Put into a piping bag fitted with a large plain tip. Pipe 1 inch diameter circles onto parchment paper or a silpat mat on a baking sheet (I prefer a silpat mat, because any wrinkles or imperfections in the parchment paper may cause uneven rising). To pipe macarons, place tip near paper or mat and squeeze bag. Without lifting tip, keep squeezing until circle is the desired size. Gently lift tip dragging to the side a bit to avoid getting a 'peak'. If you do get peaks, you can gently push them down with a finger wetted with some water. Bake in an oven preheated to 300F for 15-16 minutes. Remove macarons from baking sheet immediately by sliding a thin metal spatula underneath. Let cool completely on a rack before filling. Choose your filling flavour and HAVE FUN! Wow, they both look delicious. I see nothing wrong with the lime macarons - did you redo the shell? I would try: chocolate orange, raspberry white chocolate, vanilla passion fruit... Yum! The lime shells are deceptive and I took some very sneaky photos ;) Mmmm chocolate orange is a good one, or chocolate mint!